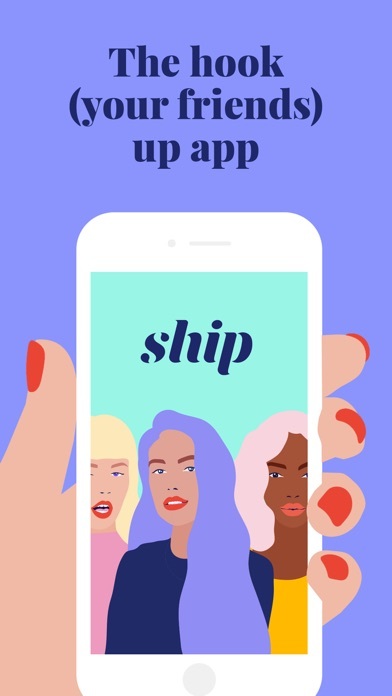 Ship is here to make dating fun again. With Ship, friends can set each other (or themselves) up -- because who knows you better than your friends? Single? 1. Sign up and invite friends to your Crew. 2. Let your Crew find you matches. You can sit back or join the search. 3. Discuss prospects with your Crew (because great dates are something to talk about). Not Single, and feel weird downloading a dating app? Plot Twist - you can still use this app. Ship has a different look and functionality when you sign up to help your friends find matches. 1. Sign up and select “I’m not single.” 2. Join your single friends’ Crews. 3. Match your friends with people you deem worthy (because that’s what friends are for). I can’t even sign up because they won’t except my phone number and it is a valid number. Nice UI but it’s just another crappy app that isn’t trying to actually match anyone. Either nobody is on the app and the profiles are fake or the profiles are real and nobody is actively using. If you are gonna enter the space... be disruptive. Matching for others is silly because few people are gonna use that. If I’m Mexican I can’t have this App?? I love the concept of letting my friends swipe for me. However, I wish you could create different “crews.” I have different friend groups that want to swipe for me, but I don’t want them in the same crew. There are definitely a few bugs that need to be ironed out and it needs more people to join, but overall, I think it has great potential! Can’t even start an account, they ask for you phone number at the very start to send you a verification code and it doesn’t come. One star because you can’t give the rating without one but in reality zero stars. The last 2 times I’ve got a notification I’ve had a match, I go into the app and the match isn’t there. There’s no way the match goes away that quick. The app doesn’t provide any customer service contact, so maybe someone on their development team will get a clue. 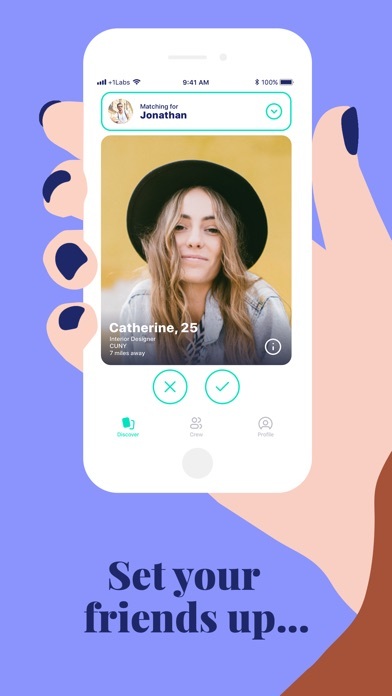 As a long time dating app user, I was excited for this new format, especially since I have some non- single friends who are going through swipe withdrawals. Unfortunately, as someone with pretty specific religious wants, I was disappointed that this wasn’t a filter option. It’s hard that you have to scroll through every single profile just to check if they match my needs first. Hoping you can add some more filters going forward! I want to love this app and I think I will as it gains in popularity and there is a larger pool to choose from. Specific piece of feedback...I would love if you could set your home location so you could still use the app when you are not in town. I’m a consultant (and as it stands, is a pretty typical career for millennials who is your target audience) and out of town Monday-Thursday. Not interested in dating outside of my hometown, so I’m limited to using the app less than half the week. Anyways, excited to see this app grow! Cool concept. The best dating app!!! As someone who’s in a relationship, this app allows me to still participate in dating apps. I’m able to swipe for friends and message them profiles of who I think they’d be a good fit with!! My friends and I always talk about dating and this allows us to be involved with each other more head on! I’m new to the app and have assembled my crew. We’re having fun swiping and discussing, but the app crashes so frequently, it’s becoming a deterrent to using it at all. I can send maybe two messages before it crashes or swipe through a handful of profiles. Love the concept, but the execution is killing me, pun intended. I’ve always helped my friends out when it came to dating, so this app has made it even easier to join in on the fun! It is so easy to use, you’ll get the hang of it quickly. I am so disappointed. It’s a very fun idea but there are so many flaws it’s not even worth using until the creators make some improvements. The interface is frustrating to use.... too many issues to list here. My main complaint is that I can’t approve matches my friends have made for me before a match can message me! My friend matched me with some weird looking guys as a joke, not realizing they automatically get piled in with the matches I have selected for myself. Now I have messages in my inbox from guys I’ve never seen that my friend thought would be funny (ie. he’s twice my age, or wearing a toupee). Of course they’d assume I’m interested if we matched, but I have no idea if these guys can see that a friend matched for me or if they think I swiped right on them with my own hand. So basically I have no control over who can contact me or who thinks I’m interested in them unless I unmatch the ones I don’t want to talk to. It’s rather alarming to open an app and have messages from guys I never seen or expressed any interest in whatsoever. I really hope they work out the kinks because I do like the concept of sharing and a group chat. I would gladly change my review of improvements are made. I am currently in a relationship, so I’m not on any dating apps, but I love the fact that I can participate too and help play matchmaker for my friends!! Before Ship, when hanging out with my friends, they would give me their phones to swipe on Tinder for them, and this brings that concept to a whole new level! Because it’s so new, there’s not a wide variety of users yet, but i believe that it has such potential to be big. Keep up the good work! I absolutely LOVE this app. The concept of your friends getting to help you in your dating life online is amazing. It really captures the essence of in person dating, as your friends help you in real life. 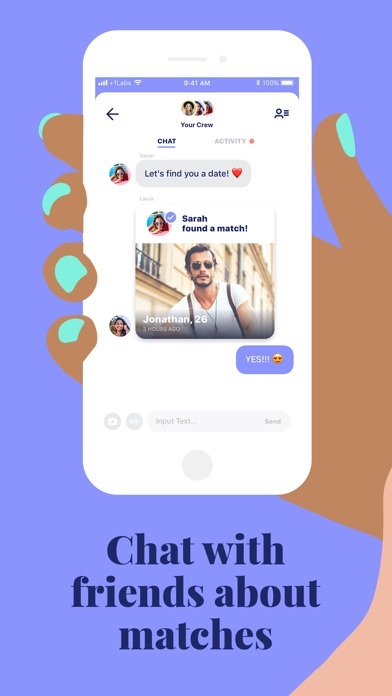 It’s also so fun to connect with your friends in relationships through this app! 10/10 recommend! I don’t usually use dating apps, but I started to use this one and it’s great! I have gotten my friends to download it and they love it to! It’s easy to navigate and connect with people. Hopefully more people will start to use it! There is no dating app like this. My friends in relationships love how they can be involved which makes the whole concept a more fun experience. This is perfect for college students who want there best friends approval and help. It is very easy to use! 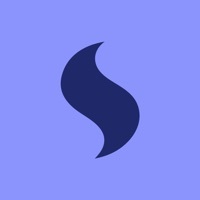 I didn’t think there could be another dating app that is not like every other one out there, but SHIP did it! I love that even though I have a girlfriend I can still find matches for my friends! I’m tired of them complaining that they can’t find someone! We came. We saw. We’re over it. Pretty sure more than half the profiles here, nobody checks because they’re empty as there are no replies back. I’ve gotten more replies on most dating apps, so it’s kind of astounding that not one person has replied back on this app. It only leads me to think nobody is on this app. I love betches and the concept is great but there are way too few guys on the app and they never respond... it seems like the people downloading it are not actually using it. Fun idea. Great innovative concept. Not enough men on this app yet. Cool concept, but they aren’t even hiding the fact that a majority of ladies on the app were sponsored to create an account with a single picture, name and age. I’m assuming there is no filtering inactive users as that would destroy their pool of “users” in the app. There aren’t even any bots I can chat with for fun! Pretty sure this app is broken. I’ve messaged all 20 of my matches and none of them have responded. Tried different openers, questions, etc. nothing. Honeslty its a overused concept. There isnt anytbing original to the idea. The girls on the app while nice are clearly sponsored by the app. Overall doesn’t feel like a real way to connect with anyone. It’s just too much fun. You really have to try. The app is super clean, you can tell they put a lot of effort in and the concept is better than you think it is. Some times it’s low key fun to see what your up against when swiping for guys. I think this is such a fun idea! However, most of the profiles only show their name, age, and distance from my friend... Common ladies! I can’t pick matches for my friend based on that. I’ve only seen 2 girls that actually wrote a little something about themselves. At least fill in more of the check boxes. A friend and I joined the app so that we could swipe for each other. Everything in the app looks good but there aren’t any “save” buttons when you create your profile. I’ve copy/pasted my “bio” at least 10 times and every time I sign in, it’s gone. It’s the same for my friend; types a “bio”, starts swiping, goes back to look at her profile and there’s nothing there. 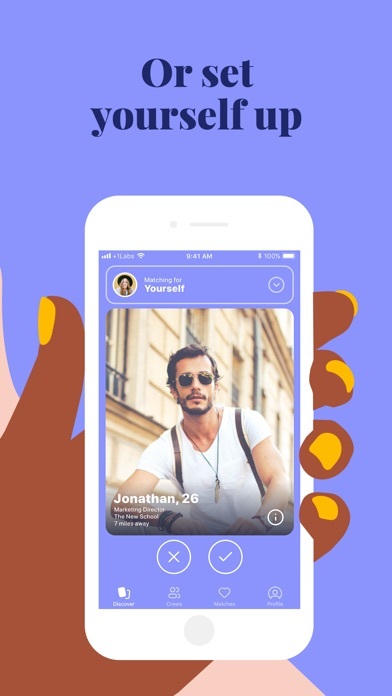 Also, I know it’s relatively new dating app but it is seriously lacking potential suitors and needs some sort of verification tool because I saw a profile of a guy that looks like he’s (not lying) about 10 years old. Such an unique way to be on a dating app. All my friends joined and we are helping each other pick! Since I’m in a relationship I’ve always missed out on dating apps. This concept is so cool and fun and I LOVE swiping for my friends. Everyone needs to download this. The app is cool - it’s fun to get my friends involved! But when they send me a profile that they think I’ll like i can’t swipe on it in the messages! That doesn’t make any sense, i don’t want to have to go to the discover page and swipe thru a million guys to see the ones my friends like for me. Very interesting concept. My friends and I already do this in real life. So fun to have an app that brings it all together. After years of taking control of my friends’ Tinder accounts, I love that this app allows me to do so on my own accord! W/ single pals who don’t make the most sound dating choices, I love hving the the ability to swipe for said friends. Ship has landed me to safe to shore!!!! It is a little hard to understand when you first download and invite your friends - that you’re adding them all to the same crew. I can’t find a way to change people into different crews. It would be better if you could separate friends into say home and college..
Is anyone active on this? Feels like nobody is. Need more people!! Love that I can swipe for my friends! Makes being single feel less lonely and more collaborative! I really like that this app allows you to message your FRIENDS about matches, etc. I think it’s really cool that you don’t have to be single as well! Overall, this really changes the dating scene, and I love how we can swipe for our own friends. Couldn’t upload more than one photo for like a week. Additionally, doesn’t seem like there’s that many guys on here. Doesn’t really make me want to swipe for my friends when there’s already so few prospects. I wish it told me location-wise where they were instead of miles. Not super user friendly, my friends and I can’t figure out how to add more than just one person to a crew. I set my detail requirements and literally got no people popping up to swipe on... which on other apps is not a problem.